Bordatlas 2012 now available easily and cheaply – Do your dream! Blimey. Only takes a few days back from Asia and I’m back into campervan mode! Our van is cleaned, had a bit of DIY maintenance, and we’re off on Friday for a couple of weeks in the UK house hunting. Just noticed Bordatlas (or board atlas!) is now available on Amazon for £17 or so. If you are off to the continent this is one of the best books. 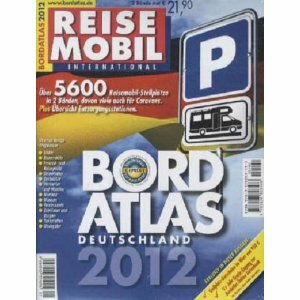 Almost A4 size and over an inch thick it has info and pictures of motorhome stops in most of Europe and it particuarly good for Germany. Whilst we are the techies, our GPS Databases now have the Bordatlas 2012 GPS POIs already installed, so you can see where the sites are on your GPS or Autoroute. The GPS POIs also tell you what page in the book to look at if you want more info. Hi you two. Glad you’re back and had a good trip. I enjoyed reading your summary and some of your thoughts on the countries. We’re looking for a long range WiFi aerial for our next trip. The one you suggest on your site doesn’t seem to work with OSx 4 according to one of the reader’s comments and Pete has recently acquired an iPad2 which he has upgraded to OSx4.something. Have you any idea what might work with it? If you are househunting near us, do pop in for a cup of tea. We’ll be around next week.